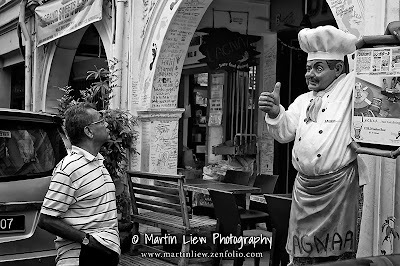 Martin Liew PhotoBlog: Street Photo - Bare Foot Dining Very Good! Street Photo - Bare Foot Dining Very Good! Nikon D70s on Tamron wide angle lens. Monochrome conversion in Photoshop using Silver Efex Pro 2 without cropping.